Rowdy just got himself in some trouble. Let’s be honest, he’s more pot-bellied pig than dog (and I say that lovingly, I myself am a recovering food addict). 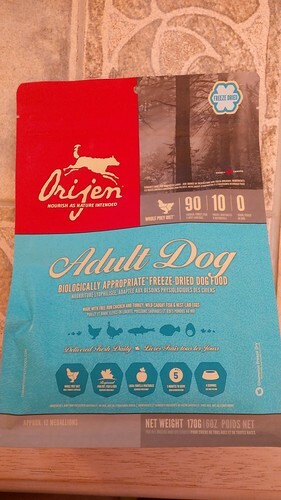 This time around, he was more than happy to help me out with a blog review of Orijen Freeze-Dried Dog Food. So happy, in fact, that he decided to eat his own and then scarf down some of Shadow’s before she got inside. Clearly, he would promote this food any day. Our dogs got to try out the “Adult Dog” version, there is also a “Tundra” and “Regional Red” version of the food. Each variety is specially formulated, balanced meals made with fresh ingredients. The freeze-drying process locks in the flavor and the freshness. 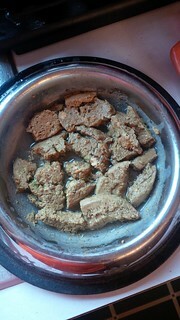 (I can attest that the food is fresh and flavorful just based on the smell as I mixed it up!) Even better, the food leaves out fillers and preservatives, leaving dogs with only the “good stuff” they would get in the wild. If you’d like to learn more about any of the varieties or pick up some of your own to try, head over to Chewy.com to learn more. 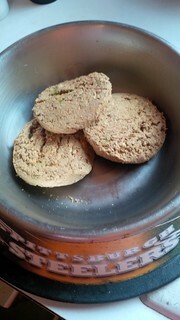 This entry was posted in Dog Products, Product Reviews, Rowdy, Shadow and tagged chewy, dog food. Bookmark the permalink.